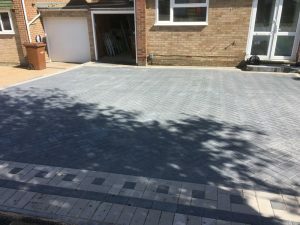 Superior Drives and Patios are a family run Kent driveway / landscaping company that have a great reputation, specialising in all types of groundwork services since 1992. Services that we specialise in include driveways (block paved, concrete, tarmac and resin), pathways, landscaping, fencing and patios. We operate in and around Kent offering our professional services at affordable prices. We have over 20 years of experience in this field and are highly recommended. References are available on request. Superior are a leading block paving, patio and landscaping company based in Kent that can offer you a first-class service with every service we provide. You can see by our testimonials that we are a hard working, professional company that can be trusted to deliver your project on time. We have a team of professional landscapers, fencers and pavers who can transform a garden of any size. We can install new fencing and replace any old turf with artificial grass or astro turf. A new sandstone patio or an imprinted concrete driveway can be installed within a few weeks of us starting your project. We can remove trees, bushes and shrubs, old concrete driveways and broken brick walls, leaving us with a clean blank canvas to work with. This is important especially for driveways as we need to excavate and compact the ground with the foundation material that will keep the driveway level and secure for years to come. We offer all our customers a free quotation with no obligation to buy, so if you are interested in having a sandstone patio, a new concrete pathway or a block paved driveway, then please contact us today. Once you have been in contact with us, we will arrange a day for us to come and see you so we can discuss any ideas and plans you may have regarding your project. We will get back to you as soon as possible with a quote. Artificial Grass, Block Paving, Brick Work, Driveway Repairs, Fencing, Imprinted Concrete, Landscaping, Patios, Resin Bound Driveways, Sealing, Steps and Turfing. We offer a full driveway repair service at a competitive price and can seal driveways and patios once they have been laid. We are happy to complete any groundwork projects for your commercial and residential properties. So, contact us today if you would like to know more about our services. The work undertaken was to a high standard and would recommend Superior Drives and Patios for their hard work and courteous nature during the time working on our property. Highly Recommended, Professional and Efficient, Excellent Result, Thank You!We are extremely happy with our new block paved driveway, it has gone from an old tarmac drive that was completely worn out and needed a lot more that a face lift, to what is now a real asset to the curb side appeal of our lovely house.The SDP team spent a lot of time discussing with us what we would like and what was needed too, they worked through unexpected problems along the way and were very professional and polite at all times. From the very start their professional quality, background knowledge and expertise where what gave us confidence in their superior work, they showed us projects in the area that they were completing and we were impressed.The guys working on the drive kept access for us at all times, they were friendly and very hardworking, despite the extreme heat wave. Finishing what looked to us to be an absolutely major project in a few days, just amazing.We could not even imagine what a difference a drive makes, we did not anticipate how good it would look and truly it is a lovely addition that surpasses our expectations.We were welcomed home to see our drive looking picture perfect, what a joy! Thank you to all at Superior Drives and Patios for the beautiful new drive way you did for us. The workmanship is outstanding and has completely transformed the front of our property. We would not hesitate to recommend Superior Drives and Patios to anyone thinking of having a new drive way. Amazing job. Really pleased with my back garden patio. It was all dug up, leveled out, flower bed extended and paved in 3 days. The guys worked very hard. I’d use Superior Drives and Patios again and would recommend them.